There are entirely too many ways to find and consume news on the Play Store, yet somehow Squid manages to be a bit different and worthy of mention. First, the bits that aren’t different, but are still good: you can select from a range of interests (such as tech, culture and politics) and you’ll then be provided with a feed of relevant news stories. Or rather several feeds, as you can switch between a combined one, a feed of ‘top news’ and separate feeds for each individual topic you’re interested in. Each of those feeds is image-heavy and attractive to look at, and with a tap you can be on the web page hosting a story. Loading these pages seems surprisingly fast, but if you prefer there’s also a reader view, which cuts out most of the adverts and other extraneous content. You can also block any sources you don’t want to see and get push notifications for new stories. So far, so familiar, albeit done well. 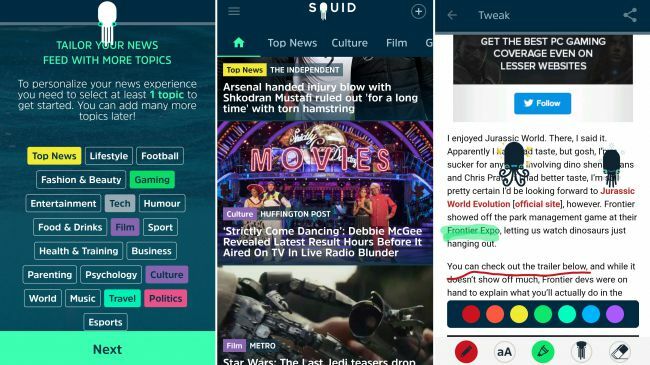 The new bit is where the name Squid comes in, as you can also annotate stories with ‘ink’, underlining or circling key bits, adding stickers, then sharing the result with friends. That’s handy if you want to draw attention to a specific part of a story, rather than the whole thing, or simply want to leave your mark on it. If that feature appeals then squid stands out from the raft of similar apps and services. If not, it’s still a highly competent and completely free news feed.